A team of the SI-DRIVE project coordination from the Social Research Centre (sfs) at TU Dortmund University, represented the project on an exhibition stand during the EU-Conference “Opening up to an Era of Social Innovation” between the 27th and 28th November 2017. 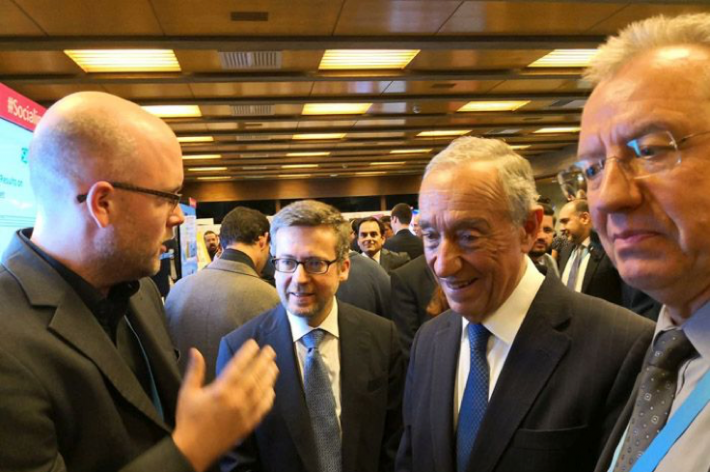 Fortunately, they could attract the attention of the Portuguese State President, Marcelo Rebelo de Sousa, and the EU-Commissioner for Research, Science and Innovation, Carlos Moedas – recommending the global mapping of more than 1.000 social innovations, the policy declaration and the Atlas of Social Innovation. A new Era of Social Innovation has been started at the identically conference, taking place in the Gulbenkian-Foundation in Lisbon on the 27th and 28th November 2017. More than 1.000 participants could also visit projects of an accompanying exhibition. „Social Innovation: Driving Force of Social Change“ (SI-DRIVE) was one of the presented projects. During this exhibition, Christoph Kaletka, Antonius Schröder und Marthe Zirngiebl from TU Dortmund University (representatives of the SI-DRIVE coordination unit) joined a conversation with the Portuguese State President, Marcelo Rebelo de Sousa, and the EU-Commissioner for Research, Science and Innovation, Carlos Moedas. They discussed the planned „Atlas of Social Innovation“ and the „Policy Declaration“ . Moreover a sequence of the SI-DRIVE-Video was viewed. It became clear during the conference that social innovation is centrally relevant in terms of adressing and shaping future transformations in society and work. Carlos Moedas underlined the high necessity to consider social innovations in connection and accordance with technological developments. Marianne Thyssen (EU-Commissioner for Employment, Social Affairs, Skills and Labour Mobility) referred to the relevance of new solutions, produced by social innovations. They could and should be used as basis for strengthening social cohesion and further developing the European economy and the labour market. In the session „The Next Social Innovation Wave“ Antonius Schröder as one of the panelists that context centrally matters when the focus comes on the possible effects of social innovation. Political support plays a huge role as well. Adressing societal challenges and creating pathways for their solution should come to the fore. Technological developments will need to be complemented and embedded with social innovations for a successful application, acceptance and for creating favourable societal impact. Peter Dröll (Director of the Directorate General for Research and Innovation) aspires a successful mainstreaming of social innovation in the future. Besides, the further development of social innovation and sustainability should not only be supported and subsidised in a reinforced but also in a systemic way. Christoph Kaletka (SI-DRIVE-Coordinator, TU Dortmund University), Carlos Moedas (EU-Commissioner for Research, Science and Innovation), Marcelo Rebelo de Sousa (State President of Portugal) and Antonius Schröder (SI-DRIVE-Coordinator, TU Dortmund University) discussed the results of the project SI-DRIVE (from left to right).